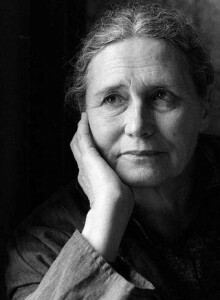 Doris Lessing, who has died aged 94, was one of the major fiction writers of the second half of the 20th century and one of the most vividly representative literary figures of our times. She was not a committee woman of letters – far from it – but she stood for what it meant to be a writer throughout that long, noisy “now”. And anyway Lessing was a nomad, a tent-dweller. She did seem free, she allowed herself to be inconsistent – obsessive, humble, brilliant, banal, serene, truthful, teasing by turns. In the mid-1980s she perpetrated a hoax on her publishers Jonathan Cape, submitting a manuscript under the name Jane Somers, which they promptly rejected (The Diary of a Good Neighbour by Jane Somers was eventually published by Michael Joseph, Lessing’s first publisher). This, she argued, showed what’s in a name. Unknowns could not get a fair share of attention. But in fact, one could read this characteristically maverick gesture in quite another way – that Lessing spoke compulsively by now in tongues, in other people’s voices, and it was the dialogue among them that was the most fascinating thing. Splitting off one voice, the old-fashioned realist one, would no longer do the trick. This restless power of self-invention may prove to have been her most distinctive quality. She was from the beginning a short-story writer and novelist of formidable originality – The Grass Is Singing (1950), the Children of Violence sequence (1952-69), many of the short stories set in Africa (This Was the Old Chief’s Country, 1951) and above all The Golden Notebook (1962) are 20th-century classics.